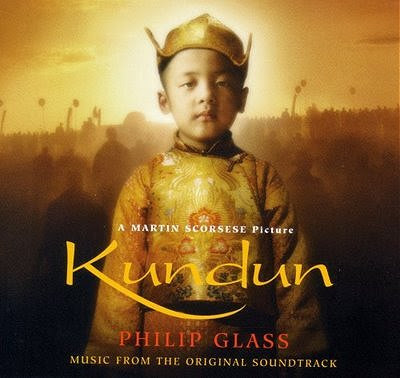 Philip Glass' score for Kundun is the realization of a long-cherished dream. For years I had hoped to work with Glass, and in Kundun we found the ideal subject for a special collabaration. His Buddhist faith and deep understanding of Tibetan culture combine with the sublety of his compositions to play an essential role in our movie on the life of the Dalai Lama. Martin Scorsese writes about his 1997 film Kundun. It tells the true story of the search in Tibet for the fourteenth reincarnation of the Dalai Lama, and the subsequent flight of the young reincarnation into exile in India. The current Dalai Lama, Tenzin Gyatso, is believed to be the latest incarnation, or tulku, in the lineage. A tulku is a Tibetan Buddhist lama who has consciously determined to be reborn, often many times. This allows him to return to continue his work in the material world, rather than remaining in Nirvana. Reincarnation is one of the most difficult Buddhist concepts for Western minds to grasp. Almost immediately after the death of a Buddhist holy person (lama), a search begins for a reincarnation following cryptic clues left in the previous lifetime. When the reincarnation is found tests, including the identification of objects from the tulkus previous life, are used to verify the reincarnation. Little Buddha is another film based on the search for a tulku. Made in 1993, it was written and directed by Bernardo Bertolucci (famous for Last Tango in Paris) with a score by the Japanese composer Ryuichi Sakamoto. Little Buddha featured appearances by Sogyal Rinpoche (author of the Tibetan Book of Living and Dying) and Dzongsar Jamyang Khyentse Rinpoche, both Tibetan teachers identified as reincarnated lamas. The fictional storyline of Little Buddha tells how the search for the reincarnation of a Tibetan teacher leads to a boy living in Seattle. Parallels have been drawn between this fictitious plot and the true story of one of the most recent and high profile discoveries of a reincarnation, which took place eight years before Little Buddha was made. At this point the story becomes even more interesting. Many Tibetan Buddhist websites carry the standard biographies of Tenzin Ösel Rinpoche giving the information I have summarised above. But after studying at Sera Monastery he went on to the private St Michael's University School in Victoria, British Columbia, where he progressed to grade 12 before going on to an unidentified university in Europe. 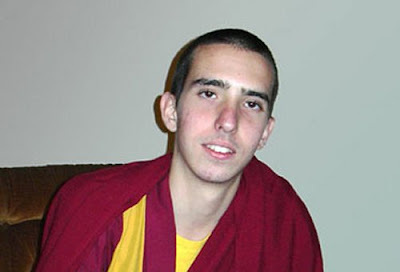 The photo below is one of the most recent available of Tenzin Ösel Rinpoche. Osel expressed great appreciation and thanks for all that everyone has done to ensure that his Tibetan and Western education has to date been the best possible. At this time, Osel feels it vitally important for him to spend more time pursuing his western education. However since for the time being that means he is not in Sera, Osel feels it is not appropriate that financial support be raised in the same way as previously. Fortunately, funding for this stage of Lama Osel's continuing education has already been secured. For the time being therefore, we have decided that until Lama returns to Sera to continue Tibetan studies, we will suspend the Lama Osel Education Fund. Thank you to everyone for your support and generosity and for all you have done to date - it really has been so helpful. In September 2006, we had a surprise visit from Lama Osel (Lama insisted he be called, simply, "Osel"). 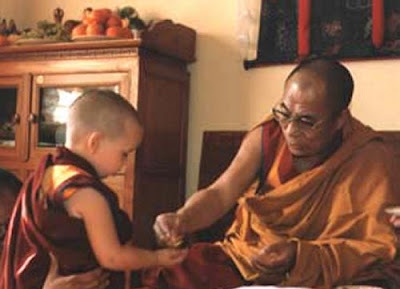 He suddenly appeared in Aptos, California at Rinpoche's house - actually, he was on summer vacation. We spent a few days together, and Osel spent a lot of time talking with Rinpoche about Dharma and his experiences of the last few years ... Osel was very happy with the visit, and so were we, especially Rinpoche; we all felt we connected again. Osel's parting advice to me with a hug was "No matter what bad things people say or do to you... just give love!" We must respect the privacy of Osel Hita and hope that he finds his own personal path. But as Western interest in Buddhism increases, I can't help thinking there is another fascinating film waiting to be made with the title Lost in Meditation. * Update 30 August 2009 -latest news on Osel. I was also sad to hear last year that my old friend Nawang Kechog* who played treling** (transverse flute) on the soundtrack. He was involved in a car accident and lost a sister (as I recall) and then suffered a heart attack. A couple of months later he sent me an email and said he was weak but pulling through. He has had to cancel concerts in Australia and elsewhere. Our thoughts go with him. * If that's how he spells it phonetically. Strictly speaking it should be spelt Ngag dBang mKhas mChog. And Osel should be 'Od gSal. What a language! Just thought you might be interested in knowing it's out there, and it gives me the excuse to write in to say thanks so much for all the time you must put into making your blog such a wonderful resource. As you might imagine, all the Tibetan and Buddhist references make it all the more enjoyable for me. Thank you for this interesting article. I was particularly happy to see the news of Osel Hita Torres and can add a few more details. I understand from another Tibetan Buddhist lama incarnation by the name of Gomo Tulku, now 20 years old (he was born, BTW, at 8 minutes past 8 on the 8th of the 8th, 1988! ), that Osel (who prefers to be called simply "Oz") completed a 3-year course in cinematographyt at the University of Madrid last year, and being best friends the two of them hope to embark on careers as hip-hop megastars, promoting the Buddha's message on a vast through this medium in the language of young people nowadays. Gomo Tulku who said at the time that he fancied using the soubriquet "El Gomo" (it was last April when he had just arrived in France from Spain where he had met Osel and made these plans, and was publicly announcing all that I have written here before a large audience)appears on Facebook where he has already posted a hip-hop number. It might be that Osel will be working with him on production, promotion and content. Let us hope that they are wonderfully successful in this project. Osel is apparently incredibly creative, intelligent and unconventional (just like his previous incarnation, Lama Thubten Yeshe, founder of FPMT) and his visit to Aptos in 2007 mentioned in the article followed his attendance of The Burning Man festival in Arizona, an avante-garde film, multi media and "happening" festival that originally began on the beach at San Francisco. "Reincarnation is one of the most difficult Buddhist concepts for Western minds to grasp." I know no one, Western or otherwise, who finds reincarnation a difficult concept to grasp. Indeed, westerners such as Pythagoras, Socrates and Plato were familiar with the idea thousands of years ago, and it has maintained some kind of presence in western thought more or less continuously ever since. If you mean to praise eastern philosophy, please don't do it by gratuitously insulting westerners and the west: it makes you look lazy and/or stupid.